I just love the middle one- silver vases filled with blooms? Perfection! I doubt I can sell Mama on it, but my brother's old bedroom has this marvelous peach and brown original tile (mine has the orginal almost wedgewood blue tile, which is a bit funky as well) . Anyway, I love this bird print- I would love to really make it fun in there. I'm in love. If I did not have a budget and Morgan to rein me in when we move in our "forever" home in a few years, well, things might get crazy up in there. BIG HAPPY SIGH. Wow, Samma, you are pulling some gorgeous pictures the past few posts. My Grandy has an eye for gorgeous wallpaper - her powder room is currently a peachy orange background with white and blue birdcages/birds. It's really lovely. 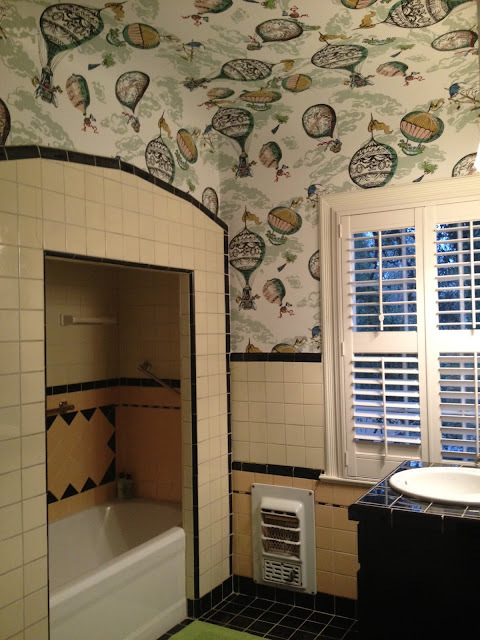 JM *hates* wall paper from when he was redoing his first house, but I think it makes such a huge pop in bathrooms. That vintage Euro / Ferris wheel wall paper in the mcCarthy's new bathroom was my DREAM for L's nursery. I still pet the sample from Anthro. Sadly, SO EXPENSIVE. And, as we are also not in our Forever Home, E axed it (I was willing to compromise with one accent wall! JUST ONE WALL!) due to the dreaded Resale. Beautiful pictures! I love how colorful and fun it all looks. I'm such a decorating coward - I'm afraid of color. Your house is gorgeous and you've obviously got a great eye for decorating. I'm sure whatever you pick will be gorgeous! I am in love with the Anthropologie wall paper. SO beautiful.